Paphos holidays have wide appeal with a guarantee of summer sun, sandy beaches, water sports, golf and historic sites, they have something for everyone. Said to be the birth place of Aphrodite, the Greek Goddess of love, Paphos is a charming resort on the south west coast of Cyprus. Holidays to Paphos offer a variety of water sports as well as a water park providing exciting attractions. Golfers have a choice of three eighteen hole courses nearby. Our range of cheap Paphos holidays will have you dreaming of golden sand, sunny days and friendly tavernas where the food is delicious and the wine flows. Holidays in Paphos should include trips to some of the historic sites both in and around the resort as the island is littered with ancient towns, tombs and monuments. If history doesn?t float your boat, you can spend relaxing days bathed in sunshine followed by lively evenings in some of the pubs and clubs. We have a good number of low cost Paphos holidays that could soon have you winging your way to sunnier climes. 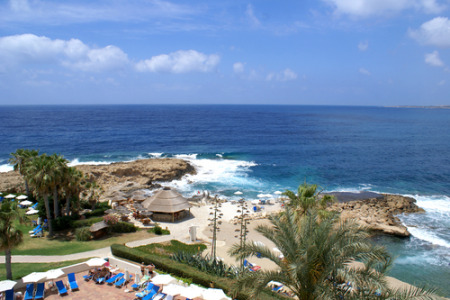 Search now to find our latest Paphos holiday deals.